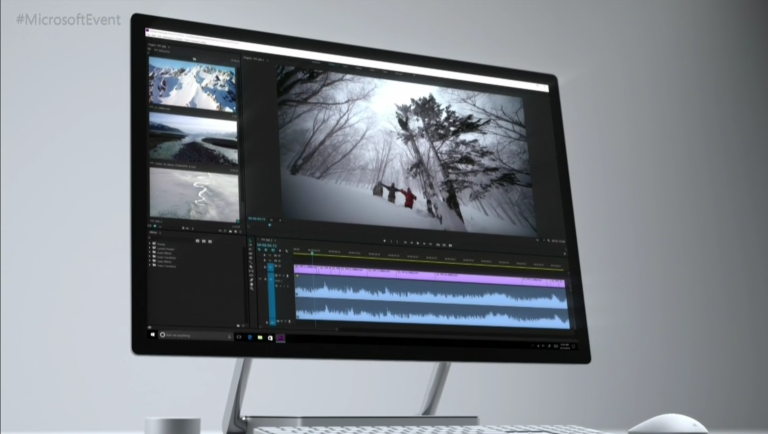 An all-in-one PC in Microsoft's Surface style, Surface Studio is designed for creatives that want to use Surface Pen to create on screen. But it's more than that - the display will detect objects on screen and can fold downwards or backwards using a brilliant new hinge (called the Zero Gravity Hinge). When the screen transitions from Desktop Mode to Studio Mode, it sits at a 20-degree angle, the same angle as a standard drafting board. It's a 28-inch all-in-one iMac rival at its heart, but there are some really cool things about this product which is "meant to turn your desk into a studio". You're meant to be able to move from drawing, to drafting to typing effortlessly. Surface Studio is only available in limited quantities over the next few months, but is available for pre-order in the US today (it's $2,999 in the US). As you can see, the 13.5 million pixel display is super thin, too. Surface Studio brings together the PixelSense display with the business-orientated Surface Hub and it's powered by the latest-gen Intel Core processors. See that hinge? There are 80 custom parts in the hinges. Surface Dial is a new form of input - it works off the screen and also on the screen (a bit like a scrollwheel). It will also work on Surface Pro as well as Surface Book and Surface Book i7 - woohoo! It'll cost $99 individually. When you place the Dial directly on the screen, it brings up a set of digital tools specific to the app that is open, allowing people to more seamlessly move through your workflow. For example, with Surface Dial, artists can change the color or the size of their brush tip as they paint without ever moving the pen away from the screen.